MOTT HAVEN — Opponents of FreshDirect's planned move to the South Bronx suffered a stinging blow recently when a judge dismissed the lawsuit they filed to halt the project. They had hoped last week's community board meeting would be a perfect time to recharge their campaign against the online grocer's proposed 500,000-square-foot facility in Port Morris. Instead, Thursday's meeting collapsed into chaos when Community Board 1 Chairman George Rodriguez abruptly ended it before members could question FreshDirect’s representatives or agree on its response to the project, even though the next full board meeting is not until September — two months after the July 17 deadline to submit input for the review. As FreshDirect opponents in the audience booed the chairman’s decision to adjourn the meeting, board member John Johnson stood up and addressed the board. Cedric Loftin, the board’s district manager, said members could email him their thoughts and he would schedule another conference with FreshDirect before the July deadline. But he did not set a date for that meeting — which will not be open to the public. “I’ve never seen such a flagrant disregard for parliamentary procedure,” new board member Michael Brady told Loftin after the meeting. FreshDirect hopes to relocate from Queens to a state-owned but privately controlled shoreline strip in Port Morris called the Harlem River Yards. A 1991 lease signed by the state and a private firm stipulated how the 96-acre site could be used, including a requirement that a truck-to-train transfer facility be built there in order to reduce traffic congestion and air pollution in the area. In 1995, the parties signed a separate agreement stating that any changes to that original plan would require approval by the City Planning Commission and the mayor. Because FreshDirect’s proposed facility includes a parking lot in the zone reserved for the intermodal rail hub, the project was submitted to the Planning Commission, which forwarded it to the community board and the Bronx borough president for input. The 30-day window that all three entities have to review the project began June 17. At Thursday’s meeting, Christina Giorgio, a lawyer representing a coalition of FreshDirect opponents called South Bronx Unite, said the company’s facility, and the parking lot in particular, would block the operation of an intermodal hub at the site and therefore should not be approved. Mark Levine, a lawyer for FreshDirect, said the company had asked a state agency to modify the site lease to allow for the 0.3-acre parking lot in the intermodal hub area. In May, a Bronx Supreme Court judge threw out the lawsuit filed by South Bronx Unite to block FreshDirect’s project. Giorgio, who is with the New York Lawyers for the Public Interest, said Thursday the group planned to appeal the judge's decision. 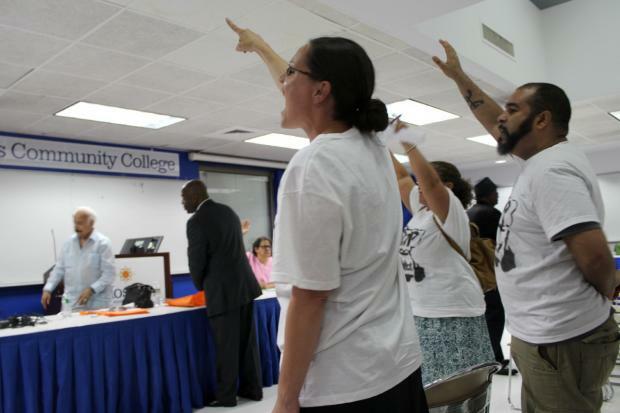 During the public-comment portion of Thursday's meeting, several community members wearing T-shirts with the word “STOP” stenciled inside the outline of fumes rising from a FreshDirect truck urged the board to reject the project. They repeated charges that critics have leveled against the plan, which could receive nearly $130 million in taxpayer subsidies, since it was announced in February 2012. The project is a misuse of public funds, designed without local input, that will block access to the waterfront and further pollute a neighborhood already plagued by asthma in exchange for a few hundred new jobs, opponents said. Some proponents of the plan also spoke, emphasizing the borough’s high unemployment rate and many health woes, which they argue will be eased by the jobs and fresh food FreshDirect has promised. A company representative reiterated a plan to upgrade to a totally “green” truck fleet within five years of opening the new facility. Community board leaders asked members to hold their questions about FreshDirect until after a separate agenda item was addressed. But by the time that discussion ended and the FreshDirect issue was reopened, the company’s representatives had left. When it became clear the board would not settle on its response to the project before the meeting was adjourned, one member asked if the leadership could gather separately and make a decision on behalf of the board, which elicited howls from the audience. “I think it was a real eye-opener for people in the community to see how dysfunctional that system has become,” said Mychal Johnson, a Mott Haven resident and outspoken FreshDirect critic who was not reappointed to the board this year. Johnson said Friday that the board meeting convinced him that residents cannot always count on community leaders to act in their best interest.